Maxine V. Radford 80, born March 23, 1939, went to be with her Lord and Savior Monday, April 8, 2019. A native to Pensacola, Maxine enjoyed many things, coaching soft ball with her girls, bream fishing (as she always caught the most), sewing and crafting, but especially spending time with her family. She loved her girls and grandchildren more than anything!! She was an Escambia County School District employee for 18yrs. 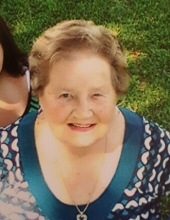 Maxine was a lifelong member of Leonard Street Church of Christ. This is where she loved helping with Lady’s Day, volunteering and visiting the sick. She was a great wife, mother, sister, grandmother, great-grandmother, aunt, and friend to everyone she came into contact with. She is proceeded in death by both of her parents, Clifford and Ruby Steele; two brothers, Jerry and Raymond, and her late husband, Daryl Johnson. She is survived by her husband of 24 years, Robert Radford; her brother, Herman (Dee) Austin; sister in law, Sadie Austin; daughters, Carla Johnson; Cindy (Ziad) Elshorbagi; Cheryl (Kris) Howell; Tera (James) Huffman; Billie Joe (Victor) Waters; 8 grandchildren; 8 great children and numerous nieces and nephews. Funeral services will be held at Leonard Street Church of Christ on Saturday April 13, 2019. The visitation will be from 9:30 -10am with services starting at 10am. Burial will follow services in the family’s cemetery, Gideon’s, Bay Minette, AL. The visitation will be from 9:30 -10am with services starting at 10am. Burial will follow services in the family’s cemetery, Gideon’s, Bay Minette, AL. Pallbearers will be Miles Howell, James Huffman, Victor Waters, Chuck Swann, Bill Morris, and Charles Burgess. To send flowers or a remembrance gift to the family of Maxine Virginia Radford, please visit our Tribute Store. "Email Address" would like to share the life celebration of Maxine Virginia Radford. Click on the "link" to go to share a favorite memory or leave a condolence message for the family.